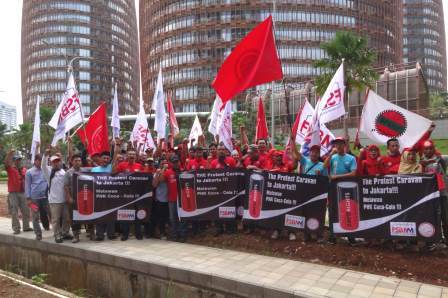 Members of the independent union at Coca-Cola in Bandung took their fight for rights to the company's national office in Jakarta on November 19 following a week-long collective refusal by victimized workers to leave the factory. The five workers who were dismissed on November 12 after rejecting a 'voluntary' retrenchment scheme targeting union members only left the plant and travelled to Jakarta in a union caravan organized by the independent foodworkers' federation FSBMM. The caravan joined other workers in a vigorous protest action at Coca-Cola Amatil's Indonesia head office in Cilandak, Jakarta.